Rudolf Hess, who was Hitler’s deputy, has been in the news lately because his remains have been removed from his final resting place in the small Bavarian town of Wunsiede; his bones were cremated and the ashes tossed into a lake. You can see a photo of his gravestone, which was removed, and read all about it in the New York Times here. In May 1941, Hess created an international sensation by secretly flying his personal Messerschmitt fighter plane to Britain and parachuting into Scotland, apparently hoping to negotiate a peace between Britain and Germany as the Axis was preparing to invade the Soviet Union. Instead, Hess was disowned by Hitler and imprisoned by the British for the duration of the war. Hess took his life in his hands on a peace mission on May 10, 1941, flying his Messerschmitt ME 110 plane under the radar, and rolling the plane over so that he could parachute out before the plane crashed in a field 8 miles from the home of the Duke of Hamilton, the man with whom he was planning to meet. Hess had only enough fuel for his 800-mile trip and no fuel for his return. The Duke of Hamilton refused to see Hess, who was going to propose that the British join forces with Germany to defeat the Communist Soviet Union. Hess also wanted the resignation of Churchill, along with a few other requests. Did Hitler authorize this peace mission and then disown his friend and deputy when the plan failed? When Hitler learned of the flight, he declared that Hess was suffering from mental illness. No one knows the truth and we will probably never know what really happened. The British, and especially Churchill, did not want peace. Hess was arrested and thrown into the Tower of London. Later, he was committed to a British mental institution. Was Hess crazy? Or was Hess just pretending to be crazy? At the Nuremberg IMT, Hess was convicted of Crimes against Peace and sentenced to life in prison. He was acquitted of Crimes against Humanity. Both of these crimes were ex-post-facto war crimes, created by the Allies after World War II. What did Rudolf Hess do that was so terrible that he was sentenced to life in prison? The Russian member of the tribunal, Maj. Gen. I.T. Nikitchenko wanted Hess to be sentenced to death, not life imprisonment. Why did the Soviet Union want to silence Hess? Did he have something to do with the deaths of 4 million people at Auschwitz, a crime which the Soviets claimed at Nuremberg? Rudolf Hess was convicted of Crimes against Peace because, as Hitler’s deputy, he had signed documents on Hitler’s behalf. Was this such a great crime that a life sentence was warranted? Hess did not give any orders that resulted in Crimes against Peace; he merely signed the documents. Was he sentenced to life in prison because the Allies didn’t want him to talk? As Hitler’s deputy, he would have known what was really going on in the Third Reich. While Hess was in prison, he was never left alone, but was constantly guarded by American, British and Soviet soldiers, who took turns guarding him. He was not allowed to touch his son when he came to visit, for fear that he might pass a note to him. What was it that the Allies did not want Hess to reveal? Before he allegedly committed suicide in August 1987, at the age of 93, Hess had spent 40 years in the Spandau prison near Berlin. The prison was torn down so that it would not become a shrine to a Nazi hero. Now his grave is gone too, but will this stop neo-Nazis from remembering a German hero? Rudolf Hess was a very early member of the National Socialist political party and a good friend of Hitler in the early days. In the photo above, taken during the August 19-20, 1927 Nazi rally in Nuremberg, Georg Halberman and Pfeffer von Salomon are standing in the front, wearing Bavarian lederhosen (leather shorts) and knee socks. 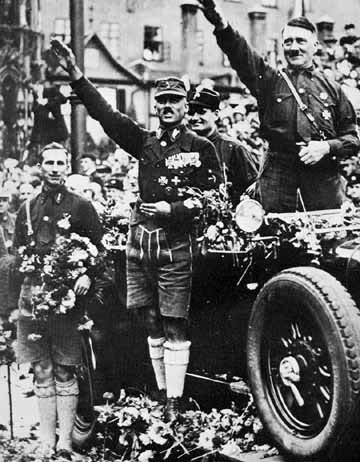 Hitler is on the right side of the photo, and his right-hand man, Rudolph Hess, is smiling in the background. Hitler and Hess are standing in the back seat of a convertible as they watch a parade of Sturmabteilung (SA) troops through the city of Nuremberg. Hess was Hitler’s strongest supporter and his personal secretary and deputy until 1941 when Hess flew to Scotland, some say at the behest of Hitler, in an attempt to negotiate with the British for peace and to put an end to World War II. At that time, Great Britain was the only country at war with Germany; the Soviet Union and Germany still had a non-aggression pact. America was not officially at war with Germany yet. Hess was immediately imprisoned by the British as soon as he hit the ground in Scotland; there were no peace talks. He was kept in prison until the end of the war; then he was tried and convicted by the Nuremberg International Military Tribunal on charges of participating in a “common design” to commit Crimes against Peace. It will take more than destroying his grave to erase the memory of Rudolf Hess, who is a true hero to many people. Testimony that more than 4,000,000 persons died at the Auschwilz (sic) concentration camp was promised by the prosecution today at the opening of the military trial of Josef Kramer and 44 SS henchmen for conspiracy to commit mass murder. A regular reader of my blog (B. Zelewski), who reads and understands Polish, sent me the link to a YouTube video which shows the proof that Poland fired the first shots of World War II, not Germany. On the video, you can hear a broadcast from Polish Radio in which the Poles are claiming that Germany has just attacked Poland — but this broadcast had been pre-recorded. This was the full communique about the outbreak of WWII, as of the 1st of September 1939. The first speaker on the video is Zbigniew Świętochowski, and the special communique, recorded on August 29th, is read by Józef Małgorzewski. The passionate message of Józef Małgorzewski (the second reader) was pre-recorded, since the Polish leaders knew there would be a war with Germany. Poland desired this war. The Poles had been promised all the help, assistance (Lend-Lease) and direct involvement (of the British and French) in a German-Polish war. The “patriotic” messages for the broadcast had been pre-recorded. As simple as that! The first radio-host (Zbigniew Świętochowski) blurted out that “the Germans attacked them “in the fifth hour this morning”. “The fifth hour (w piatoj godzinie)” means between 4:00 A.M. and 5.00 A.M. Wait a minute! Hitler said that he had ordered (his soldiers) to return fire only as of 5:45 AM Central European time. Poland is located East of Germany; Germany and Poland are in the same time zone. Hitler could not have lied about this. Everyone had heard his orders and no German soldier would have opened fire before 5:45 A.M. on that day. The first shot from the German side came from the training battleship “Schleswig-Holstein” two minutes later. It is now obvious that it was Poland that started the war. Poland attacked first! The Bible of World War II is The Rise and Fall of the Third Reich, written by William L. Shirer, an American correspondent in Berlin in 1939. I have a first edition of his book from 1959. At the time that I purchased and read his best-selling book, I was totally uneducated with regard to World War II, and I did not detect that his version of history was very biased; he was on the side of the Allies and very much against Germany. “This night, for the first time Polish regular soldiers fired on our own territory. Since 5:45 a.m. we have been returning fire, and from now on bombs will be met with bombs. Oswiecim, Poland — In an upstairs room at the only remaining synagogue in this town, 37 miles west of Krakow, 13 future American military officers wrestled with ethical questions in the actual shadow of Auschwitz. For example, German army units could have questioned orders to kill Jewish civilians. According to Frey, a few German army units in the 691st Wehrmacht battalion that fought in Russia refused orders to kill Jews and were not punished. Most of the units, however, obeyed the orders. I was not familiar with this particular incident, but I immediately suspected that there is more to this story than what was included in the news article. Were Wehrmacht soldiers ( in the regular German army) ordered to take time out from fighting on the Russian front in order to “kill Jewish civilians” for no reason other than that they were Jews? In the fall of 1941, the Wehrmacht’s 691st Infantry Regiment was charged with »security and pacification duties« in occupied Belorussia, in the area west of Mogilev, Orsha, and Vitebsk. Although the regiment’s first battalion reported daily about »enemy contact,« there was no indication of a partisan threat. When I read that this incident concerned partisans in Belorussia (White Russia) that immediately rang a bell. Around four years ago, there was a movie about the Bielski brothers, starring British actor Daniel Craig. The Bielski brothers led a gang of Jewish partisans in Belorusssia during World War II. For some reason, this movie never caught on. It was totally gone and completely forgotten after only a few days in American theaters. Maybe because it was too bloody and portrayed the Jews in a negative way, fighting as illegal combatants. The official story of the Holocaust is that the Jews were innocent victims who did nothing to provoke the Nazis. They (the Bielski brothers) did not hesitate to eliminate Jewish snitches and collaborators and were responsible for saving 1,200 Jews from being killed in the Holocaust. Their courageous story went untold for decades but later this year a movie based on their tale and starring Daniel Craig, the current James Bond, will hit the screens. The screenplay is based on a book, “Defiance: The Bielski Partisans,” written by Dr. Nechama Tec, a sociologist from the University of Connecticut and herself a Holocaust survivor. Apparently, at least one of the American cadets on the visit to the town formerly known as Auschwitz knew about this incident when a German Wehrmacht officer refused to carry out an order and nothing happened to him. Two other German officers who did carry out the order were put on trial in a German court after the war. On May 8, 1954, the Landgericht Darmstadt [Darmstadt State Court] found the former company commander Friedrich Nöll and his Hauptfeldwebel Emil Zimber guilty of acting as accessories to manslaughter and sentenced them to four and three years in prison respectively. The sentences were reduced to three and two years in 1956. In the opinion of the court, Nöll and Zimber were responsible for the execution of the Jewish inhabitants of Krutsha – most of whom were old people, women, and children. Did the Nazis use Jewish tombstones to pave roads? The operative word here is reportedly. Who reported this? 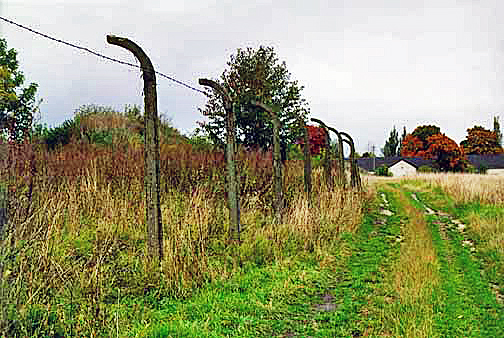 The claim of gravestones being used as paving slabs is reminiscent of the scene in Schindler’s List which shows a road through the Plaszów labor camp that was allegedly built with tombstones. 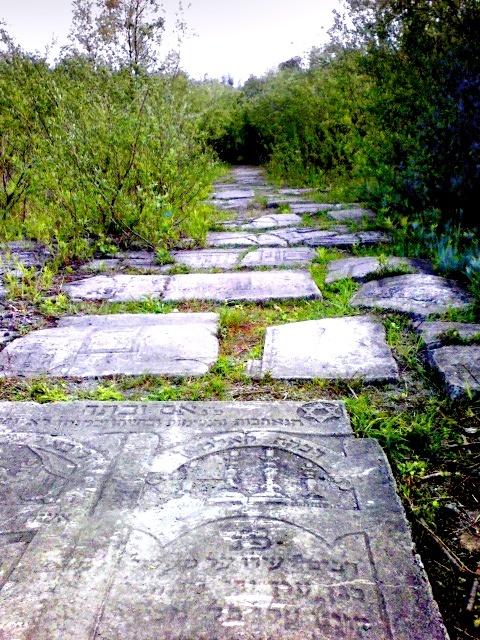 The road through the Plaszów labor camp, paved with headstones torn up from Jewish cemeteries, is a replica of the actual road that existed there. The road adds to the historical accuracy of the film but also symbolizes the destruction of the Jewish race. The removal of the headstones from the cemeteries represents the enormity of the Holocaust. Unsatisfied with simply wiping out existing Jews, Goeth, by planning the road, denies acknowledgement of many Jews’ final resting places. By removing the grave markers, Goeth in effect erases the existence of the dead. Moreover, Goeth forces the Jews in the camp to build the road, rubbing in their faces the fact that they, too, will soon be erased. The message is clear: the Nazis view the Jews as not worth even grave markers and want only to erase them from history. 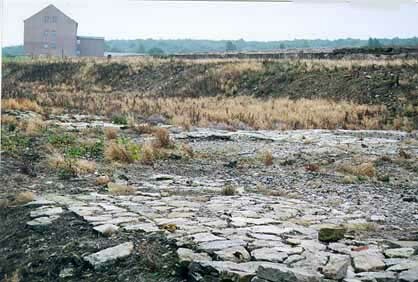 Are there any photos of the “actual road that existed” at Plaszów? There are plenty of old photos of the Autobahn, but I’ve never seen a photo of “an actual road” that was paved with tombstones. In October 1998, I visited the site of the former Plaszów camp and took the photo above; it shows the spot where the barracks of the Plaszów concentration camp once stood. The camp was surrounded by houses on three sides and on the fourth side was a road, which is shown in the picture. 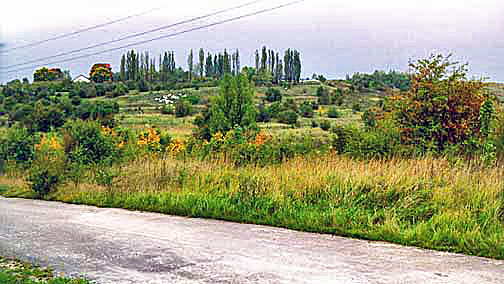 The camp Commandant, Amon Goeth, lived in a house that is out of camera range in the above picture; his former house is located to the right and behind a hill so that it cannot be seen from this spot. The fictional Schindler’s List movie shows Amon Goeth shooting prisoners from the balcony of his house although the camp cannot be seen from his house. To reach the site of the former Plaszów camp, which is 10 kilometers from the city center of Krakow, my private tour guide drove up a hill on a rutted one-lane dirt road, thinly covered with small white granite rocks. Maybe that was the road that was allegedly paved with tombstones, and my tour guide neglected to mention it. 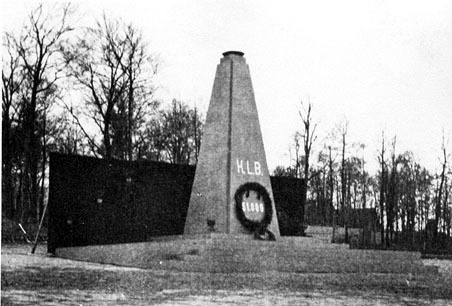 The construction of the Plaszów labor camp began in June 1942. 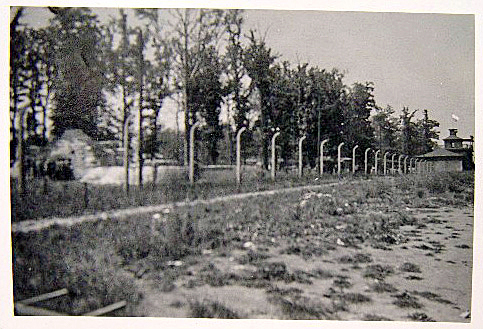 The photo below shows part of the fence around the camp. According to my 1998 tour guide, the granite quarries near the future location of the Plaszów camp were owned by a Jew, and the Nazis confiscated his property without compensation. There was a Jewish mortuary chapel near the cemetery, which my guide told me the Nazis converted into a stable. There are many other stories of the Nazis using a Jewish place of worship as a stable. Although crushed granite from the quarries was readily available, the Nazis allegedly desecrated Jewish graves by ripping out the tombstones, then using slabs of the broken grave stones to pave the camp road, like stepping stones in a garden. 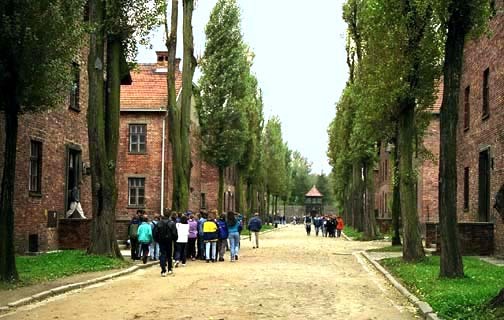 As shown in the two photos above, the streets of the Auschwitz main camp were paved with crushed granite, but according to the fictional Shindler’s List movie, the Nazis couldn’t be bothered with making a crushed granite road through the Plaszów camp. Now British teen-aged students are being told the story that the Oswiecim cemetery was reportedly raided for stones to pave roads in Auschwitz. 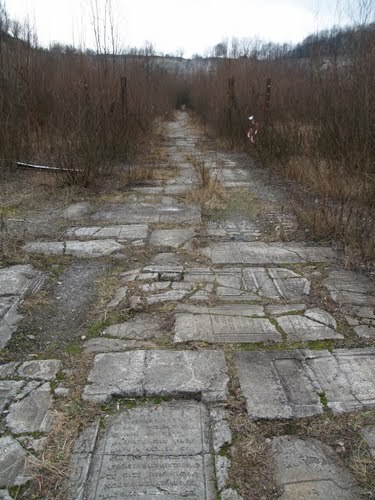 It would have required a lot of unnecessary work to pave the streets of the Plaszow camp with unbroken headstones; it is difficult to make a level path with stones of different thickness. On my trip to Poland in 1998, I also visited the Majdanek death camp, where I purchased a guidebook, which said that the path into the camp, called “the black path,” was paved with tombstones. 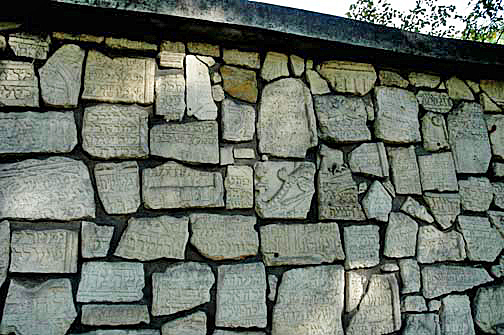 I also visited a Jewish cemetery in Krakow in 1998 and again in 2005. According to my 1998 tour guide, the cemetery adjacent to the Remu’h Synagogue in Krakow was desecrated by German soldiers who used the grave stones for target practice. The broken pieces of the stones were put into a memorial wall, which the guide said is called the Wailing Wall. This morning I was searching the internet when I came across a web site which mentioned that Hitler ordered the extermination of all the Jews on December 12, 1941. The source given for this information was Christian Gerlach. I looked him up on Wikipedia here and learned that he is a professor of Modern History at the University of Bern in Switzerland. Professor Gerlach has written lots of books and essays and his credentials are impeccable, but is he right about the date of Hitler’s order? Let’s consider what was happening on December 12, 1941: Hitler had just declared war on America in a long-winded speech on December 11, 1941 which you can read in full here. President Roosevelt immediately responded by declaring war on Germany on the same day. According to Christian Gerlach, Hitler gave the order to kill all the Jews the next day after his declaration of war against America. But wait a minute! The gassing of the Jews had already started on December 8, 1941 at the Chelmno death camp. Every student of the Holocaust knows that! What did Buchenwald look like when Elie Wiesel was a prisoner there? Elie Wiesel’s book Night has very few details about what the Buchenwald concentration camp actually looked like when he was a prisoner there for several months just before the camp was liberated on April 11, 1945. There is an article here on the Elie Wiesel Cons The World web site about the curious lack of a detailed description of Buchenwald in Elie’s most famous book. The Buchenwald camp was mainly a concentration camp for political prisoners; as a Jewish prisoner, Elie Wiesel would not have been allowed to walk around the whole camp, so he may not have seen everything. One thing that he would have seen is the gatehouse into the camp, which is shown in the photo below. All incoming prisoners entered through this gatehouse. Note the clock on top which is permanently stopped at 3:15 p.m., the exact time, on April 11, 1945, when the Communist prisoners took over the camp and the SS men fled into the woods. 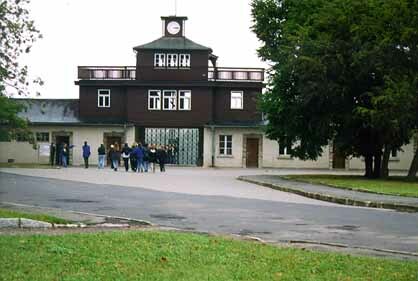 This view of the gatehouse is what Elie Wiesel would have seen as he marched up to the camp. 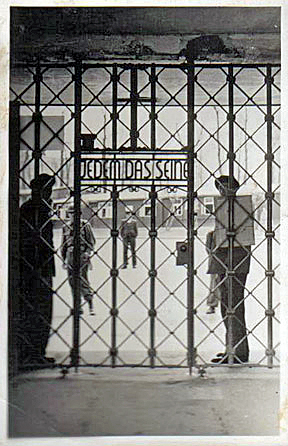 Jedem das Seine is usually translated into English as “To each his own,” but the phrase has the connotation of “Everyone gets what he deserves.” Buchenwald was a Class II concentration camp for dangerous political prisoners and hardened criminals, who had little chance of being released, so the Buchenwald camp did not have the “Arbeit Macht Frei” sign that was used on Class I camps. Note that the photo above was taken from inside the camp, looking out; the sign faces the inside of the camp. 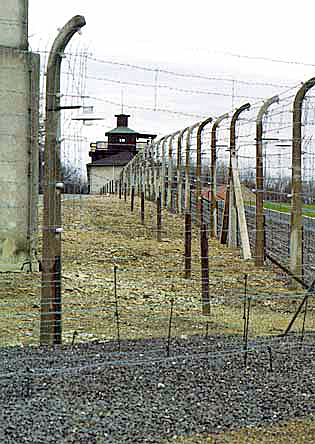 Buchenwald had the usual barbed wire fence around it; in this old photo, the gatehouse is shown on the extreme right. On the left side can be seen the Zoo. Yes, those mean ole Nazis had a zoo for bears and other animals, but only the SS men, who guarded the camp, were allowed to visit it. The Buchenwald camp was built on the northern slope of a gentle hill, so that all the prisoners in the main part of the camp had a view of the gatehouse from their barrack windows. In the foreground of the photo below you can see the doors into the root cellar where potatoes, carrots, turnips and rutabagas were kept for the prisoners’ food. The camp diet consisted mainly of whole grain bread and vegetable soup. Each prisoner carried his soup spoon in his pocket; the enamelware soup bowls on display in the Buchenwald museum are the size of an American serving bowl. In the photo above, taken from the gatehouse tower, the large two-story building on the far right is the camp storehouse, which is still standing today. The photo below shows the same storehouse building on the left; the one-story building on the right was where the prisoners had to go through disinfection before entering the barracks. In the foreground is the stump of Goethe’s oak. Buchenwald is in the middle of a woods where Goethe used to sit under his favorite oak tree. The one-story building to the right in the photo above is the disinfection building which is connected to the storehouse by an underground tunnel. Incoming prisoners were first brought to the disinfection building where their heads and entire bodies were shaved. Then they were completely submerged into a large tub of creosote to kill lice and bacteria. Then they had to go into the showers, after which they were sprayed with a liquid disinfectant. All this was done in the effort to stop epidemics in the camp. At the end of 1942, a quarantine camp was set up in the northwest section of the camp, far down the slope from the gatehouse. 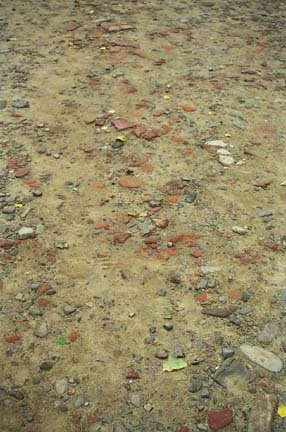 The prisoners called this the “Small Camp.” The photo above shows a stone path at the former location of the “Small Camp,” which was torn down long ago. Note how close the “Small Camp” was to the the storehouse and disinfection building. The prisoners didn’t have far to walk after their disinfection and shower. The quarantine camp was called Camp II by the SS. At first Camp II consisted of 12 army horse stables of the kind used for barracks at Birkenau, the notorious death camp in Poland. These buildings had only very small windows underneath the roof, not like the other barracks in Buchenwald which had lots of windows at eye level. In 1945, Camp II, aka the “Small Camp,” had become increasingly overcrowded as Jewish prisoners were brought from the abandoned camps in Poland. During this period, between 1,200 and 1,700 people were packed into each horse-barn barrack which measured 40 meters long by 9.5 meters wide. When the barracks were full, some of the prisoners were put into tents. Thousands of prisoners died of disease in the “Small Camp” which eventually became a camp where sick and dying prisoners were isolated from the rest of the prisoners. The interior of one of the regular Buchenwald barracks is shown in the old photo below. The photo below shows a barracks building for Jewish prisoners. Note the star of David inside a circle at the top of the building. 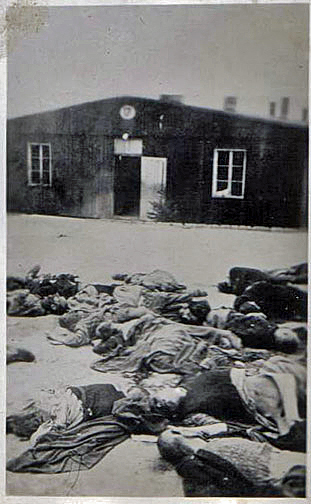 This photo was taken immediately after the camp was liberated; it shows dead bodies in front of the building. All incoming prisoners in all the concentration camps had to stay in the quarantine barracks for several weeks in case they had some disease that was contagious. At Buchenwald, the “Small Camp” was the quarantine camp. 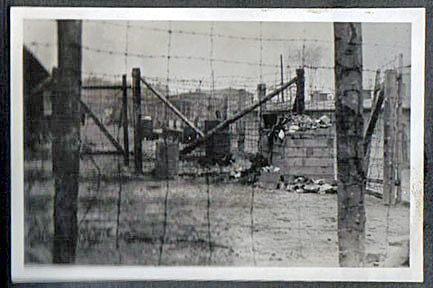 The photo above shows the “Small Camp” which was sectioned off from the main part of the camp by a barbed wire fence. The death rate for Jews was higher because they were living among prisoners who were possible disease carriers. 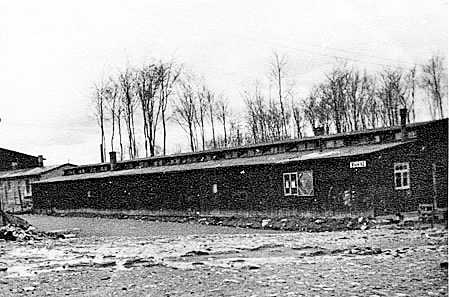 Most of the Buchenwald prisoners lived in long, low wooden buildings like the one shown in the photo above. There were more than 30 of these wooden barrack buildings, each of them accommodating between 180 and 250 prisoners. 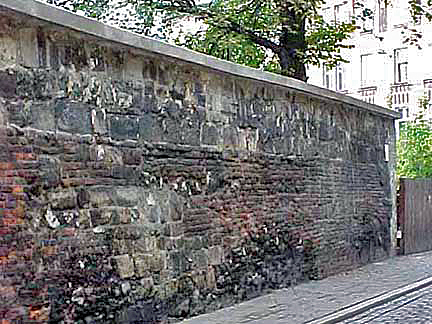 These buildings, which were called “blocks,” measured 53 meters long by 8 meters wide. There were also 15 two-story brick barrack buildings in the main part of the camp, which was for the Communists and other political prisoners. 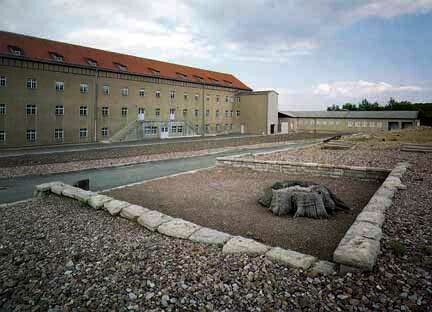 The photo below shows a reconstructed barrack near the spot where the “Small Camp” used to be. 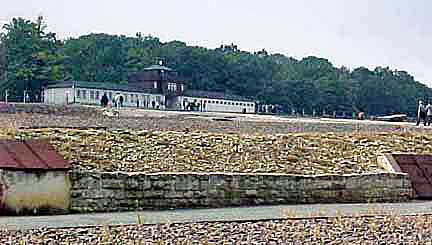 Buchenwald became the third major camp in the German concentration camp system on June 3, 1936, when the Inspector of the Concentration Camps, SS General Theodor Eicke, proposed to transfer the concentration camp of Lichtenburg near Berlin to Thuringia, a state in central Germany where Buchenwald was to be located. The wooded hill called the Ettersberg was officially chosen as the site of the camp on May 5, 1937 and on July 16, 1937, the first 300 prisoners arrived in the camp. Like all of the major concentration camps in Germany, there was an SS garrison right next to the Buchenwald camp. 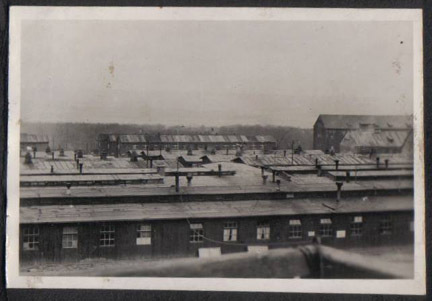 The photo below shows some of the SS barracks buildings that are still standing; Elie Wiesel would not have seen these barracks buildings. 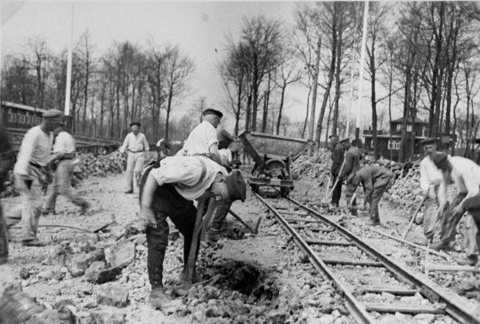 In 1940, a railroad line was extended to the Buchenwald camp. 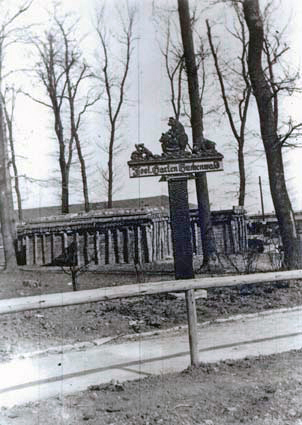 The old photo below shows the Buchenwald gatehouse on the right hand side. After arriving at the railroad station inside the Buchenwald camp, the prisoners marched into the camp on a road that led from the railroad station to the gatehouse. There were a few “Red Spaniards,” or Communists that had fought the Fascists in the Spanish Civil War, who were imprisoned at Buchenwald. These Spanish prisoners named the road into the camp Carachoweg (Caracho Way). The Spanish word caracho was prison slang for double time. The Communist political prisoners, who lived in the barracks near the gatehouse, discriminated against the Jewish prisoners and would not allow them into their nicer section unless they received a bribe. After the camp was liberated, the Jews were not even allowed to attend the celebration ceremony which was conducted by the Communist prisoners near the gatehouse. 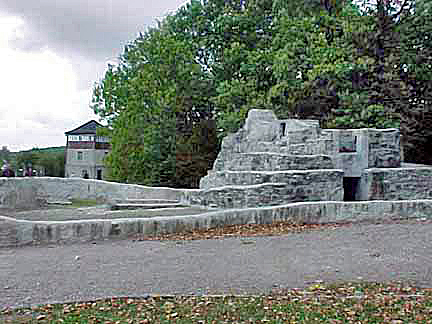 The monument shown in the photo above is the memorial that was erected by the Communist prisoners at Buchenwald on April 19, 1945 in honor of the political prisoners in the camp. The Jewish survivors were not allowed to attend the ceremonies when the monument was dedicated. The camp had actually been liberated by the Communist prisoners before the American soldiers arrived at around 5 or 6 o’clock in the evening on April 11, 1945. This stone monument was moved in 1961 to a spot called Frederic-Manhes-Platz, which is the place where the road to the camp branches off from the main road up the hill called the Ettersberg. The place where it now stands was named after a French Resistance fighter named Col. Henri Frederic Manhes. Buchenwald was one of the camps to which many of the captured partisans in the French Resistance were deported. Yesterday, on the Dr. Oz TV show, the subject was how to prevent or cure cancer, but more importantly, there was a segment on how to take care of your kidneys. According to Dr. Oz, there are two things that can damage your kidneys: high blood pressure and diabetes. I have been going to a Traditional Chinese Medicine doctor since I had a stroke over a year ago. According to TCM theory, it is the other way around: weak kidneys CAUSE high blood pressure and weak kidneys are also the CAUSE of diabetes. So how do you know if you have weak kidneys? Your first clue is having to go to the bathroom to urinate at night. According to my TCM doctor, this means that your kidneys are so weak that they must work overtime to eliminate the toxins in your body; normal kidneys rest at night. Another clue is having white space showing under the pupils of your eyes, which means that you have toxins in your body that are not being removed by the kidneys. Also, having swollen ankles, caused by retaining water, means that your kidneys are not working to eliminate the water. And when your kidneys are really weak, you will feel exhausted all the time. Today is the anniversary of the July 20th Plot to assassinate Hitler in 1944. 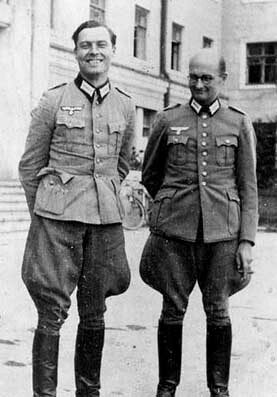 The hero of the plot, which failed, was Lt. Col. Claus Schenk Graf von Stauffenberg, the man on the left in the photo above. You can read all about it here. Notice the resemblance to Tom Cruise who played Stauffenberg in a movie about the plot. For some reason, the movie never caught on, and it quickly faded into oblivion. I don’t even remember the title of the movie. Carolyn Yeager has put up a new article on her web site www.eliewieseltatto.com which addresses the issue of Elie Wiesel’s description of the Buchenwald concentration camp in his book “Night.” You can read the full article here. Ms. Yeager does not believe that Elie Wiesel was ever an inmate at Buchenwald. One would think that a highly acclaimed writer like Elie Wiesel would have painted vivid word pictures of the Buchenwald camp. But that is not the case, as Ms. Yeager points out. She has come to the conclusion that he was not at Buchenwald because he did not describe the camp at all. I have to say Wiesel doesn’t describe Buchenwald at all. You don’t know anything about Buchenwald from reading Night. You don’t learn much about Eliezer or anyone else. You are given an impression of suffering, without rhyme or reason, so Buchenwald becomes synonymous with suffering, that’s about it. We don’t know what it looks like. In every Holocaust survivor book that you will ever read, you will learn that the morning beverage that was always served in every camp was a coffee substitute, which was called “ersatz Kaffee” in German. Coffee was very expensive in Europe during World War II. Keep in mind that coffee beans do not grow in Europe, so coffee had to be imported, and in wartime, there were more important uses for ships. Even in America, coffee was expensive and lots of people drank Postum, a coffee substitute. My family drank real coffee, but my mother made it so weak that I hated the taste of it. To this day, I have such bitter memories of her light brown coffee that I never drink coffee. One might argue that Elie Wiesel was only 16 years old when he was in Buchenwald and he may not have been familiar with the taste of real coffee, so he didn’t recognize that he was drinking a coffee substitute. However, back then it was common for very young children to drink coffee. I started drinking coffee at such a young age that I don’t even remember how old I was at the time. Besides that, Elie wrote that he had previously been in Auschwitz; according to numerous Auschwitz survivors, ersatz coffee was the only drink ever served. At Auschwitz, the water wasn’t fit to drink, so it had to be boiled and the foul taste disguised with coffee flavor. How could Elie have thought that the Germans were serving real coffee to thousands of prisoners in war time? This was his second big mistake. Potato peels found on the grounds of the kitchen? Has Elie Wiesel ever been to Germany? The German people do not throw potato peels on the ground — ever. Except maybe on a compost pile. But in the camps, the potato peels were put into the soup. Heinrich Himmler, who was in charge of all the concentration camps, was a health nut. One of the main foods in all the camps was potatoes, which were put into the soup with the peeling still on. Himmler knew that the prisoners had to get all the necessary vitamins and minerals from a small amount of food, so he would not have allowed the potatoes to be peeled and the peelings thrown on the ground. Many Holocaust survivors and Prisoners of War have written that the peelings were left on the potatoes that were in the daily soup. The health movement started in Germany and back then, people in America were not yet eating potato peels. As far as I know, the utensil known as a potato peeler did not yet exist back then. Potatoes were peeled with a paring knife. Knowing that Americans did not eat potatoes with the peeling on during World War II, all the Holocaust survivor books, that I have ever read, describe the potato peelings that were in the daily soup. This was one of the greatest crimes of the Holocaust according to the survivors, who interpreted being forced to eat potato peelings as being treated like animals. The POWs were especially critical of the Germans for serving soup with the peeling still on the potatoes. Elie Wiesel probably heard a survivor of Buchenwald talk about eating potato peelings and assumed that they ate peelings that had been thrown away. The Buchenwald camp was built on a hillside so that, from the roll call square, a prisoner could look out over the entire camp. The orphan’s barrack in block 66 was in what was called “the Small camp,” which was at the bottom of the hillside. 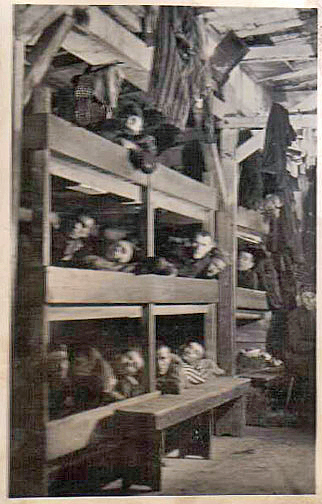 Elie Wiesel claimed that he was put into the orphan’s barrack after his father died. Buchenwald was mainly a camp for political prisoners, but the prisoners in “the Small camp” were mostly Jewish. That’s because the Jews didn’t arrive at Buchenwald until late in the war when they were marched out of Auschwitz and brought to Germany. “The Small camp” was used as a quarantine camp for new prisoners. At first, the newly arriving Jewish prisoners had to be kept in quarantine at Buchenwald, so as not to spread any diseases that they might have brought from Poland. Yet, Elie Wiesel described how the Jewish prisoners were allowed to enter the barracks on their first day without taking a shower. Elie also wrote in Night that he and his father were taken to the former Gypsy barracks on their first night in Auschwitz — without taking a shower. According to his book Night, Elie and his father were not put into the quarantine barracks at Auschwitz-Birkenau, which are the barracks near the Gate of Death that are now shown to tourists. The problem is that Elie wrote Night before other Holocaust survivors wrote their books and gave little details about the camps that are so important if one is going to write a fake Holocaust book. On his own web site, Elie called Night a novel, but then Oprah had to ruin everything by selecting his book as her Book of the Month. A new edition, translated by Elie’s wife Marion, was put on the market and it was classified as a true story.